Last week marked my second visit to Meme for their Thursday lunch special (they’re normally just open for dinner). 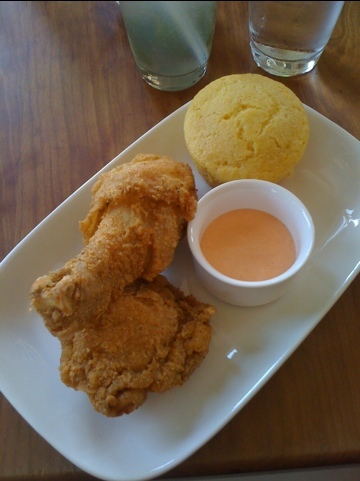 $11 gets you the only dish on the menu – two pieces of amazingly fried chicken, a piece of cornbread and a drink. An extra $2 gets you the side of the day. Go here. It is so, so good. this looks like heaven in a few bites (or maybe many if I savoring it). I need to add this to my list. what is the sauce? July 12, 2011 at 8:55 am. Permalink. It’s a spicy mayo – possibly sriacha? It’s delicious! July 12, 2011 at 8:58 am. Permalink.